This original fourteen chapter book is a brief, slightly autobiographic tale of medical oncologists, surgeons, radiation oncologists, and breast cancer patients in a well-established cancer center in Texas, who pursued the goal of cure for breast cancer. The evolution of improved outcomes in the treatment of microscopic metastatic breast cancer is also the story of the development of adjuvant chemotherapy for post-operative breast disease. The adjuvant therapy of breast cancer came about with the realization that this malignancy, when diagnosed in most patients, had spread beyond the confines of the primary cancer. Patient histories in the form of Case Studies are used to illustrate certain issues. Devoted to the development of the chemotherapeutic regimens that currently are used to treat patients with advanced breast cancer. Chapter 6. Concluding Thoughts — Where Do We Stand in the Quest for the Cure? George R. Blumenschein, M.D. led a team of brilliant young researchers at the M.D. Anderson Cancer Center who established Adriamycin as a mainstay of contemporary breast cancer treatment regimens. 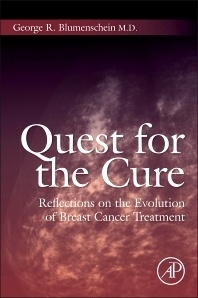 This book is intended to empower interested individuals by chronicling the development and explaining the rationale underlying contemporary multimodal breast cancer therapy and by providing illustrative patient histories. in part by one doctor’s vision and advocacy for people with this disease." with patient anecdotes, which he presents alongside the science."